유전체 변이 분석 프로그램. SNV calling from NGS data의 결과 VCF와 혈연관계 정보 PED 파일을 입력하여 다양한 변이 분석을 수행한다. 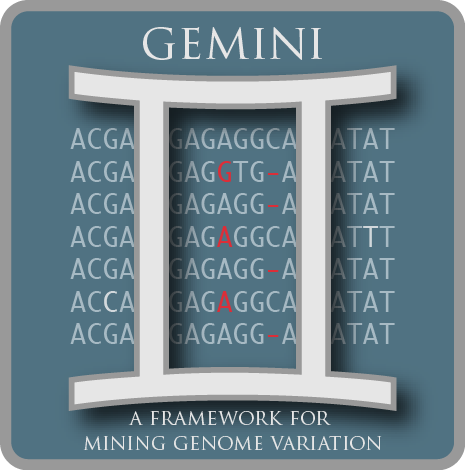 GEMINI는 GEnome MIMIng의 약어. 다음과 같은 기존 자료와의 비교 분석을 수행하고 분석 결과를 SQLite에 저장한다. SNV 변이 분석은 다음 두가지 도구 가운데서 선택할 수 있다. de_novo: Identifying potential de novo mutations. autosomal_recessive: Find variants meeting an autosomal recessive model. autosomal_dominant: Find variants meeting an autosomal dominant model. pathways: Map genes and variants to KEGG pathways. interactions: Find genes among variants that are interacting partners. windower: Conducting analyses on genome “windows”. stats: Compute useful variant statistics.